We export High Temperature Elastomeric cables to whole world. By utilizing skills of our dexterous workforce, we are offering a comprehensive assortment of HT Elastomeric Cables. We manufacture these cables by employing optimum quality material along with sophisticated technology in adherence to the defined industrial standards. Our cables have wide application in all kind of industry and are used at home too for wiring. To meet the diversified requirement, these are being offered in various sizes, shapes and colours. The Elastomer cables of Bhuwal Cables are popularly known as Rubber cables and probably the first type insulation in the world. Originally it was with natural rubber for both insulation & Sheath, however, in late 70s, it has been replaced by synthetic rubber for insulation & sheath. We are considered to be one of the leading manufacturer and exporter of an extensive range of Electrostatic Precipitator Cable. These are applicable for industrial purposes to remove particles from the streams of exhaust gas. These are made using superior quality raw materials. Available in different sizes, thickness and length, our client can purchase these from us at cost effective ranges. 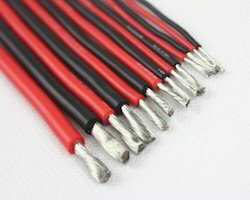 We introduce ourselves as one of the noted manufacturer, trader, exporter and supplier of Silicone FG cable 18 . The best quality of raw material in a perfect ratio is used to manufacture our offered cables. These cables are precisely tested for tested conductivity, tensile strength by our dexterous professional which helped us to come up with such distinct range. These cables are available in full range of sizes and shapes at industry-leading prices. Owing to our state-of-art manufacturing unit and the usage of leading-edge technology, we are able to present a comprehensive range of Silicon Elastomer Cables . Keeping in mind current market development, these cables are manufactured by our qualified professionals employing premium quality raw material and modernize tools. Our offered range of product is praised for being solid or stranded, insulated and is used for welding applications inside electrical or electronic devices. Our company is specialist in manufacturing and exporting superiority Silicone Elastomer Flexible Cables. Our manufacturing unit utilizes best machinery and raw materials in creating these flexible cables. These cables are then checked by experts to ensure its quality before the delivery process. Our clients can purchase these cables at industry standard rates along with their specified requirements within the mentioned time period. We are one of the chief exporters and manufacturers of superior quality Heat Resistant Silicon Elastomer Cables. We manufacture these elastomer cables using best quality techniques along with resources. The expert professional team supervises the products before exporting. Our potential customers can avail these products at market leading rates to meet their requirements within the mentioned time period. We are reckoned manufacturer and supplier of wide assortment of Silver Plated Copper Wire. Our offered wire finds its application in electronic industries for making electronic appliances and tools. This wire is manufactured using optimum grade silicon with the help of high-tech techniques in compliance with set industry norms. Moreover, it is checked for its quality on series of quality parameters before being supplied to our clients. Clients can avail this wire from us at pocket friendly price.